Note the darker flanks, white underside, broad eye strip and white under-tail. 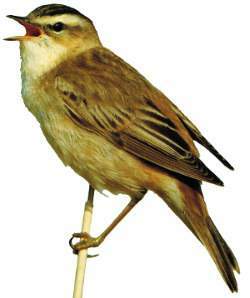 Widespread summer visitor from Saharan Africa, breeding throughout the UK and Europe. Preferred habitat is reed beds and associated scrub. Often seen singing from high wetland bushes such as Alder. 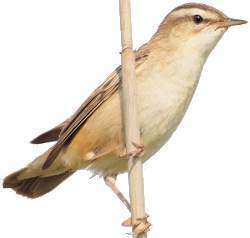 The Sedge Warbler is usually first seen singing boldly from a high perch near marshland, it's white eye stripe can appear very prominent in bright light conditions. Occasionally the bird will sing whilst fluttering upwards and then descending back to it's perch. Visually the Sedge Warblers patterned, streaked upper plumage differentiates it from other common warblers who share it's habitat.